Tropic Like It's Hot on the Verandah with The Brisbane Lions! Be seen at the city's hottest new social event. It’s the most scenic Verandah in Brisbane - the view is second-to-none, we're not Lion. 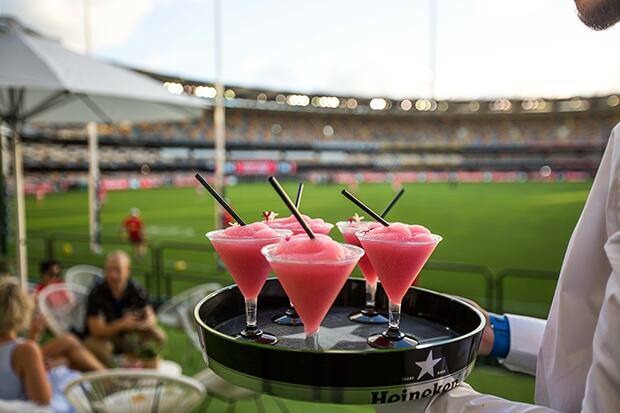 The Brisbane Lions are bringing the footy to you in the most authentic Queensland way – The Verandah! It’s going to take your footy experience to the next level, literally. The Verandah is now on sale for just $70 a ticket. The Verandah is strictly limited to 18+ and Round 1 tickets are available through Ticketmaster. However, the only way to truly guarantee a seat on The Verandah is with a 3 Game Pass from just $150.00. You can purchase tickets to watch the game from The Verandah and experience boutique food and beverage offerings, beautifully styled spaces and plenty of "instagrammable" moments, along with amazing views of the game and no crowds to block your view! There's no better way to watch the Lions play this season!